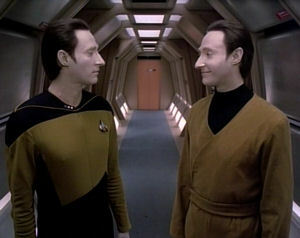 While visiting his homeworld, Data and the Enterprise crew discover and assemble another android, Lore. However, this dead ringer for Data may not be as perfect as he appears. Data practicing how to sneeze is really funny. There's a children's drawing of the Crystalline Entity killing a bunch of colonists. Why would a child sit down and draw it, complete with people running and screaming, and how was there a reason for somebody to post the drawing on the wall like "a proud parent"? Apparently, everybody knows the story of Dr. Soong, whose lifelong ambition was to create Asimov's positronic brain but who disappeared after a miserable failure. Despite this, nobody ever suspected that the most famous robotics expert might be responsible for this android with a positronic brain? I don't know why, but I really like the montage of the engineers rebuilding Lore. Though the story is your typical evil twin tale, Lore's existence is pretty clever. If you were to create a perfect positronic man full of human emotion and psychology but with wildly enhanced strengths, abilities, "needs and ambitions," it makes sense that the android would probably become sociopathic. Power corrupts and all that. Thus, the confusion over the two androids' "birth" order makes sense. Lore wasn't too perfect; he was dangerous. I like the exchange between Yar and Picard about trusting Data, especially when Picard addresses the rest of the bridge to reassure them that Yar's question was "necessary and legitimate." Yar probably should have asked the question in private, though. When Riker asks him to check in on Data discretely, it is one of the first instances of somebody actually utilizing Wesley for his cleverness and observational skills. Unfortunately, Data already warned Lore to not underestimate the boy, and later, Riker and the rest of the adults fail to heed Wesley's warnings yet again. Why doesn't Wesley just tell somebody that "Data" said "Beautiful, isn't it"? He had plenty of opportunity to tell Riker, like in the turbolift on the way back to the Bridge. Worf finally gets to fight. Too bad he loses so badly. He's doing a terrible job representing the Klingons. Dr. Crusher running out into the hallway with her arm on fire is pretty cool. Why does Data say "I'm fine" as a way of reassuring everybody that he's not Lore? And how come nobody--not even Wesley--picks up on it? For the sake of sanity, I will refrain from pointing out the many, many times Data uses contractions, but this particular instance is a pretty glaring error.